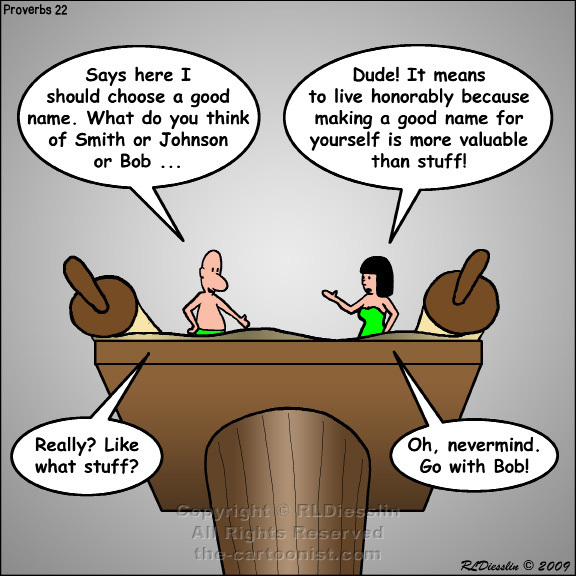 A good name is to be chosen rather than great riches, and favor is better than silver or gold. 2 The rich and the poor have this in common: the LORD is the maker of them all. 3 The clever see danger and hide; but the simple go on, and suffer for it. 4 The reward for humility and fear of the LORD is riches and honor and life. 5 Thorns and snares are in the way of the perverse; the cautious will keep far from them. 6 Train children in the right way, and when old, they will not stray. 7 The rich rules over the poor, and the borrower is the slave of the lender. 8 Whoever sows injustice will reap calamity, and the rod of anger will fail. 9 Those who are generous are blessed, for they share their bread with the poor. Well, this is clearly a nice set of ideals, simply stated and perhaps true on a good day. Job might take issue with this at various points of his test, but may generally agree with it afterwards. Still, all-in-all it's a good set of guidelines - live right, stay way from bad people, raise your kids right, and be generous and care for the poor. In the words of Mr. Spock - live long and prosper. Side note: the next book in the Bible is another wisdom book - Ecclesiastes. This is one of my favorite books in the Old Testament and is well worth the twelve very short chapters to read. It's not mentioned in the lectionary so it won't be addressed in this book but it ponders the meaning of life in an interesting way.